Today a coworker sent me a link to this story that showed up in her news feed. I wonder how she knew I liked hermit crabs! Anyway it is about a rescuer in the NY, NJ, CT area that rescues unwanted carbs. It touches on how they need a lot more than what people people are led to believe. I was wondering if she is or was a member here? I hope she has more than one tank if she has 30 of them! I just have Sonny and Cher in my 55 gallon! I was thinking the same thing. I could see maybe having that many micros or smalls in a 55. We were concerned about adding 12 crabs, mostly mediums, to a 55. Motörcrab wrote: I was thinking the same thing. I could see maybe having that many micros or smalls in a 55. We were concerned about adding 12 crabs, mostly mediums, to a 55. I have 6 medium/large in a 90 and it seems like enough. I had 66 in a 135 before the ant catastrophe. The idea of only being able to keep a few crabs in a big tank is completely new in the last few years. So long as they all can molt safely, having a colony is very natural for them - in the wild they can be found in massive pileups. They are very comfortable in large numbers and will often choose to pile together rather than stake out their own spots. wodesorel wrote: I had 66 in a 135 before the ant catastrophe. 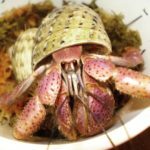 The idea of only being able to keep a few crabs in a big tank is completely new in the last few years. So long as they all can molt safely, having a colony is very natural for them - in the wild they can be found in massive pileups. They are very comfortable in large numbers and will often choose to pile together rather than stake out their own spots. Ok. Cool! I think I will keep my eyes open for adoptions then. Interesting. I always tried to follow the guidelines on here. Crabs per gallon determination by size. I wonder how that was determined many moons ago? On the next Dr. Phil, "Crab Horders!" Great article though! We have 5 in our 30 gallon but hoping to add maybe 1 or 2 more when we get the 55 gallon set up....depending on how much room we actually have after new decor lol. Right now the 30 gallon is crowded and a disaster. I also am constantly fixing fallen suction cups so I want to figure out a new method using something more permanent yet also still able to move hanging things around...something maybe I could glue to the upper rim of the inside and then maybe zip tie hanging items....I’m super uncrafty though so I don’t know what I’m going to do yet. I’ve had 20 ish crabs from small to jumbo in a 150 g tank for over a year now, and before that, around a dozen or so in my main 55. We have had, at one point or another, up to 5 tanks from 29g to 75g (when I had a roommate who was also a crabber). Our tanks have always been overcrowded due to most recently formed crab groups size guidelines, but I have never had any issues that could be directly linked to crowding. Most of my crabs are PP’s, and I have 2 straws and 3 E’s and everyone seems to be eating well and swimming fine and happy. I have had deaths, (out of over 100 crabs in going on 5 years of rescuing it would be impossible not to) but I’m confident those are related to PPS and being in poor conditions prior to adoption/rescue. I really dislike answering the question when asked how many crabs I have. Honestly...too many!! However... I will say that I do think it is extremely important to provide optimum noting space, extra protein and multiple calcium choices! I will also say that I don't think Es handle overcrowding well at all. GotButterflies wrote: I really dislike answering the question when asked how many crabs I have. Honestly...too many!! However... I will say that I do think it is extremely important to provide optimum noting space, extra protein and multiple calcium choices! I will also say that I don't think Es handle overcrowding well at all. It’s such a loaded question in groups nowadays. Also I used to chat with other group admins frequently before life and going back to college happened and let me tell you-EVERY single one of them was overcrowded by their own group standards. I wish that people weren’t so quick to dogpile newbies for improper setups or not crabbing EXACTLY like everyone else all the time everywhere. We don’t all have access to the same supplies, finances or even live in the same areas (weather wise) so what works for say, me in Dallas with my tank at a steady 80% humidity and 75 degrees F with no heater (I have a brand new UTH in the package ready to apply I just haven’t moved well since my car wreck a couple of months ago), isn’t going to when I move to Tucson and have super super dry desert air to battle. It’s also become so competitive with the tank decorating. It’s fun and if you can afford it, go wild, but not everyone can buy $25 pieces of mopani wood and $16 shells so if they are using more affordable or DIY options don’t make them feel bad about it.